Robbie Brady is seeing a specialist today to assess the extent of the damage sustained during Saturday's Premier League game against Leicester, with Independent.ie sources confirming the Irishman is fearing the worst from the diagnosis. 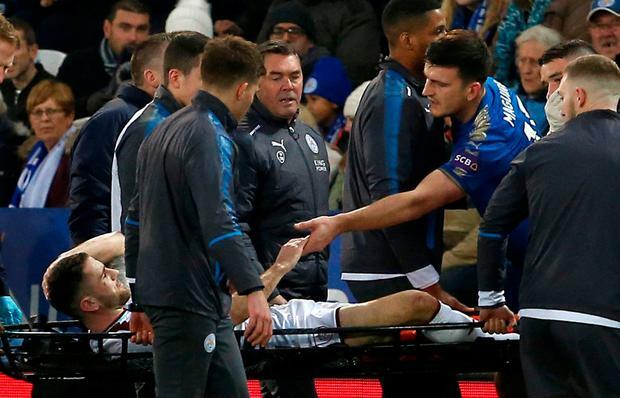 Burnley midfielder Brady was taken straight to hospital after he was stretchered from the field following a clash with Leicester’s Harry Maguire, with medics waiting for swelling to subside before making a conclusive decision the knee problem. We have been told that Brady will learn more about his fate at some point on Monday, with the club then expected to release more details on how long the Ireland No.10 will face on the sidelines. His fellow Irishman Stephen Ward offered up a gloomy verdict on his compatriots condition following Burnley’s 1-0 defeat on Saturday, amid some fears that Brady may not play again this season. “Obviously we don’t know the extent of it yet but it didn’t look great,” Ward told the Lancashire Telegraph. “Fingers crossed that it’s not as bad as it looked. He’s been outstanding for us recently and if it is bad he’ll be a massive loss for us.